Which of course gets me thinking on Monday morning (the logical time to think cookies and cake, right?) of my favorite Amish-made or “Amish-style” baked goods. I even find myself pondering a dramatic question: If I were stuck on a desert island and could only have one (yes, a very realistic scenario), which would I choose? If you read the original 5 Favorite Foods post, you’re probably not surprised when I say I’m going with a pie. However, the jury is still out on which. I’m going through my mental files of pies I’ve eaten as I try to decide. There are some good ones in there (I’ll let you know which specific pie in the comments a little later). I’ll also throw it out to you – If you could only eat one Amish-made baked good, which would it be? Something sweet, or salty? A pie like me, or something else? 72 responses to Which is the best Amish baked good? Pie, pie and more pie!!! And pumpkin whoopie pies!!! Oh my. I’m getting hungry!! The funny thing is, I don’t believe I have ever seen an Amish made cake. Is that an uncommon food? Harriet that is a good point, cookies, pie, dessert bars are common, cakes you don’t see as much of, in shops at least. I’ve had it at Amish birthdays, but not often otherwise. Cake ! Definitely ! There’s very few Amish gatherings without a cake.I’ll list some of my personal favorites, tho I hardly ever have it because of dietary reasons. You just don’t see them much in bakeries as much, because they’re harder to keep fresh and people are not as likely to buy a big cake(so there’s cupcakes). That makes sense Rebecca about why they’re not seen in shops. I guess they don’t stay as fresh around the house either. Thanks for the great list of cakes. Do you ever have them at church fellowship meal? Every time I’ve had cake in an Amish home it seems like there has been a wollop of ice cream and another dessert like pudding to go with it. I wouldn’t normally do that kind of sugar overdose but I figure why not. I think I had cake for a Valentine’s supper one time as well, come to think of it. We don’t usually have cake at church fellowship meals, more likely pie,cookies, or fruit pizza.At youth suppers,v-ball games,family gatherings,reunions,frolics,housewarmings and any other larger gathering.We also usually have cake or bars to eat with breakfast. How about if I get the recipe and post it on here. I don’t have it with me now,check in tomorrow. Thanks Rebecca. I’ve had dessert bars at church in Ohio but not in Pennsylvania, and no cake at any church meal that I can recall. Does anyone have the recipe for the giant sized raised soft sugar cookies that are sold in the Amish markets? Fry Pies! They are AWESOME!! Fry Pies are our absolute favorite! Not available in all Amish areas. Apple, blueberry, cherry, strawberry creme, raspberry, etc! I’ve always liked the things I’ve gotten there. Nice business. Pie! We like them all, but fresh fruit pies are my favorite. My ultimate “weakness”? Peach pie! Lol! My favorites are Whoopie Pies – chocolate preferred, but it doesn’t matter and shoo-fly pies. For me it would be the wet bottom shoo fly pie. However, having said that…not all shoo fly pies are equal. I’ve had some so-so shoo fly pies and then have had some that just melt in your mouth with just the right amount of sweetness. I guess just like us “Englisher’s there are good cooks and then the not so great cooks. Harriet, I have had a shoo fly cake before purchased at an Amish stand. Very Dry..but went down good with a cup of coffee. I tried to make wet bottom shoo fly pie. A lot of my friends enjoyed it…but I guess I am just not a molasses girl! I have never eaten anything made by an Amish person that I know of but I did eat in an Amish style restaurant (who knows if the cook was Amish). I had the best cherry pie I have ever eaten there. It makes me wonder if the high amounts of sugar in the Amish diet might have become common because of earning a living by manual labor. Our culture has developed some concerns about sugar, but it’s a very efficient delivery system for calories! I also wonder if the reason I’m seeing more Amish (especially women) who look overweight might be because of changes in the lifestyle without corresponding changes in the diet. I don’t claim to know whether they are healthy or not. BMI is hardly a good indicator of overall health. There’s also a growing concern among the Amish about our dietary habits.A lot has to do with so much more buying from the grocery store with added preservatives in about everything, more GMO products, soybean oil in so many products, etc.But I am happy to see a growing trend among our people of using whole grains, natural sweeteners :maple syrup,honey,stevia,sucanat . There is also much more health and diet education than say a generation ago.There are also those who believe weight and health problems are genetics.I partially agree, but not totally, as there do seem to be families that eat high fat and sugar diets and are still in good shape.But are they actually healthier, who’s to say ? If anyone has a GOOD gluten-free bread recipe that doesn’t get soggy or too dry – I’d love to have it .My E-mail is listed on a previous comment. CREAMSTICKS, CREAMSTICKS,CREAMSTICKS_ DEFINITELY the best local pastry ! And the best ones are from Hershberger’s Farm & Bakery. Naomi, in some areas, cream stick doughnuts are also known as Long Johns. They are like a long, 6-inch, rectangular donut texture with a cream filling, with maple, chocolate, or vanilla icing on top. At one business the short creme sticks are called Mini Janes! Me, the only Amish sold treat that I’ve had the luxury of sampling was the broadly popular pretzel. I had one bough from a grumpy Amishwoman in Philadelphia once, but it was so delicious that some of my mates had to pick at it too. The bonus is you can, if stranded on an island you can, if you rationed it, have it for multiple meals in a day…. I like how you factored the stranded on an island idea into the equation, Shom. I’ve been leaning towards a pie with nuts for the protein value for that reason 🙂 But in the end I might just choose the one that tastes best. what happened, my reply (about pretzels) didn’t seem to be posted, maybe I must have not confirmed I am not a spammer. Oh dear. Fun article today though. maybe my connection is playing tricks…. There might be a delay in it appearing but should be okay now. Has to do with a speed plugin I am currently tweaking. If it happens again let me know. ….is like asking which of my ten fingers is my favorite, or which of my children I’d choose to keep. Boy, you don’t mind asking the hard ones, do you Erik? Sidenote: I was a bit surprised (and honored) that I was considered quotable…, but then it occurred to me that when it comes to praising Amish baked goods, most of us would readily echo any of the accolades of anyone else around us. And yes, all my verbiage here is an attempt to buy some time in order to decide my answer to your most perplexing question. Which one item? — oh man! As I mentally survey the Amish bakery that I most visit (Jamesport, MO) — my little heaven here on earth — there is hardly anything in there that couldn’t vie for that coveted spot. Donuts (of course), fried pies (of course times two), pies (definitely a strong contender). Irma (the Amish owner/baker) makes these pecan caramel rolls that are to die for. (I’ve ordered a dozen dozen to be put in my coffin just in case heaven can’t compete with them.) But at this moment, even the rolls have to take second place to Irma’s breads. Now I’m not talking about her wheat or honey oat or similar “light” breads (although they are quite good), but her mini-loafs of denser super-moist pumpkin and poppy seed and apple-slice breads (very similar to a moist zucchini bread if you’ve had that). Boys, that’ll make a puppy pull a freight train! — or as we say down south, “That’ll make ya wanta slap ya mammy!” (but not really). The best Amish baked good I had were Maple Buns….I bought a tray of them…they were the most delicious, scrumptious buns I have ever had in my entire life….they were so covered with icing that you couldn’t tell where one bun ended and the next began…so we just cut them in pieces and ate them that way! I live near Conewango Valley, NY and plan on making more trips down this summer for more buns from the Troyer household! If they have some kind of nuts on them this is a potential top 10, top 5 candidate for me. I like all kinds of cinnamon rolls/sticky buns but they need pecans or some other crushed nut to reach the next level. Three cheers for Krispy Kremes. I was recently in one of the older stores in downtown Raleigh, NC, where you can see via a large window the donuts coming down the line and getting their cream coating. Krispy Kreme on steroids, I want to try that. The Krispy Kreme Challenge is an annual charity event in which participants run a 2.5 mile road course leading to a Krispy Kreme Doughnuts shop, eat one dozen doughnuts (totaling 2,400 calories and 144 grams of fat), and run back to the finish line in under 1 hour. The event was started in 2004 and is still planned and executed by Park Scholars at North Carolina State University in Raleigh N.C.. Profits from the race are donated to North Carolina Children’s Hospital, and the 2014 race brought total donations to $758,000. What a calorie bomb. You’re right, that’s very NC. Pepsi (invented New Bern, NC) could also be on the menu. Some people have never eaten a homemade doughnut! Imagine that! I can’t even imagine Krispy Kremes on steroids! I once had a coworker who was high (literally) on Krispy Kreme doughnuts. He brought a big box of them to work one day and I grabbed a couple and retired to my office to enjoy them. At least I intended to enjoy them, until I actually tried to eat one. Sorry to have to tell you guys from the southeast this, but those are positively the nastiest things I ever tried to eat in my entire life. I actually gagged on the 1/4″ of pure sugar glazing on them. Took two bites out of one and then flushed the rest down the toilet! There might be Krespey Kreme stores in the Golden Horseshoe area of Ontario where I Live, but in the vicinity of me there are none, my Toronto residing Aunt and Uncle brought my family and I a box of KK once, but they seemed pretty unremarkable to me, mind you, the Golden Horseshoe area is pretty well saturated by Tim Horton’s restaurants, seemingly with a store or drive through on every other corner, we’re on a constant sugar or coffee rush hereabouts, and the ‘local’ version of KK fare seemed to be adapted to the local ‘Timmies’ market(monopoly really), mind you, I like muffins lately, and if you want a good muffin in Ontario I’d go to Country Style, they are more substantial than at TH. I love there bread and their pies equally. Have bought several of both from the Pawnee City, NE. school auction this last Saturday. Have also gotten some from Jamesport, MO. Both not too far from where we live. Definitely a pie like you . I think you’re fine on that Rebecca, I’m sure you meant everything in good measure 😉 After all, too much of anything can be bad for you, even water. cookie. They are baked, not fried. Through the years, I’ve been at two different Swartz. families on Saturdays several times as they’re preparing for church, and each time they’ve given me a couple of these pies to take home. Does any Amish America reader know the name of these? Here in Big Valley, Belleville, Pa, we call those either Moon Pies or Half Moon’s. We use regular pie dough, cut in a circle and filled with the apple snitz, folded over and pressed around the edge. I love when my Amish neighbors have church and too many left over! She always shares with her neighbor’s. At their food stands, you can always find the Half Moon’s, Whoopie Pies, homemade bread and sticky buns, plus regular pies and often Angel food Cakes. Yum, yum! Nice and light, but sweet, doesn’t need any icing. sometimes some raspberry syrup is whirled through them too. I love them all!! Stranded, huh?…OK, this is cheating–I’d choose a pie, but a PIZZA pie. I know the Amish aren’t KNOWN for their PIZZAS, but I know some Amish make/eat pizzas. I’m sure I’d love it! I’ll bet the crust itself would be to die for! My friend, Miriam Girod (Swiss Amish) has the best rolls ever. They are made from a light but not sweet bread dough, rolled with cinnamon, sugar a and butter. After baking she puts on the usual icing, but not too heavy. You can taste the cinnamon and the tender roll as much as the sweet icing. And when they are war, with her carefully prepared coffee, nothing better! Pour into 9″ by 13″ greased pan. Sprinkle> 1 yellow cake mix on top. Melt> 3/4 cup butter and pour on top. Bake 50 min. or till done. Serve warm with ice-cream or cold with whipped cream. And commenting on the pizza- I LOVE PIZZA ! -and so do most other Amish. Thanks Rebecca! This sounds delicious!!! My favorite is rhubarb pie. The Amish know how to make them. I got one from Ben’s Bakery in Shipshewana, Indiana. It was awesome. Let’s hear it for cookies! Either Monster Cookies with peanut butter, or cookies made with goodies of oatmeal, coconut, chocolate and butterscotch chips, nuts, and mini M&M’s. My husband would eat pie for breakfast, “boi” for lunch, and pie again, or in another language, for supper. Oatmeal Cake, moist, with a topping of coconut and nuts, is also a favorite. My philosophy is that pie is like prayer…good at all three meals and any other time of day (or night) in between, good when you are happy, good when you are down. Pie doesn’t fix things like prayer does, but it is ALWAYS GOOD! Cakes, Cakes, Cakes,& more Cakes ! 1 Chocolate cake mix ( prepared as directed and baked in a jelly roll pan)or bake your favorite choc. cake from scratch. Cook together:5 Tbls. flour & 1 1/4 cup milk until thick. Cool. In separate bowl cream :1 cup sugar & 1 cup shortening or softened butter. Beat until fluffy, then blend into flour mixture. Spread on cooled cake. Add more hot water if to thick to spread. Spread on cake and enjoy ! This one is so easy it’s almost cheating. Prepare 1 white or yellow cake mix and bake in a jelly roll pan. Mix 1 box jello, except with half as much water. When cake is done, poke top with fork and pour jello on top, refrigerate until jello is set. Topping: 1 box instant pudding except with half as much milk. Chill until set and add 1 tub Cool-whip. Flavor variations : Lemon/Lime, use lemon cake mix and lime jello. Orange/Pineapple, use orange jello and mix crushed pineapple into topping. For Christmas, use red jello and tint topping with green food color. For 4th of July, add frozen blueberries to cake and use red jello. I’ll try to add more tomorrow. Let me know if you want a specific one. Rebecca…thank you for the recipes you’ve listed so far. I would love to have the cinnamon roll cake recipe. Thanks for sharing! Sorry to those of you who wanted Cinnamon Roll Cake recipe, I couldn’t find it. So, bear with me,I’ll try to put it on next week. Have a good memorial Day week-end. Oh, by the way, I had forgotten Graham Streusel Cake til last night when we had a neighborhood gathering, so I’ll try to have that, too. has Amish recipes for various baked desserts, cake, cookies, pie, and breads. I have been kind of glad that sweet breads are not called cakes. Even though they have sugar, we are more free to eat Pumpkin Bread and Zucchini Bread if they are not a dessert! Calling those treats pumpkin “bread” and zucchini “bread” is great dessert branding. You’re exactly right, it’s only bread, nothing fattening like cake! For the record, I really like both of those “breads”. I always enjoyed Coffee cake and Choc. Mayonnaise cake. And monster cookies are my children’s favorite from my Amish cookbook. Sorry folks, I didn’t have the real Swiss Roll Cake recipe, so here it is . This one is better than the Ho-Ho Cake.Though they are both good, of course because they’re Chocolate! MIX: 1 choc. cake mix as directed. Pour half of batter in 13 by 9 pan and bake 15 min. Cool. Un-wrap 1-14 oz. bag caramels. MELT:1/4 cup butter, add caramels, turn off heat, stir in 1 can sweetened condensed milk. Pour over cooled cake. top with remaining batter. Sprinkle with 3oz. choc. chips and 1 cup chopped pecans. WARNING ! This one is very rich.You might get a sugar overload because you have to have just a little bit more.It’s SO addictive . Erik, you need to make Rebecca a guest blogger! Seriously! You could set up a whole section for Amish recipes. And they don’t all have to be baked goods. I’ll bet she has great recipes for main courses and side dishes, too. Sounds interesting ! Is there any specific recipes you’d like, I’d be glad to share. They have quite a variety of Amish cookbooks if anyone is interested. For those with health concerns they have a few Gluten-Free cookbooks and Healthy Choices(all recipes are no refined sugar or flour), plus it has a lot of helpful hints and even recipes for natural soaps and cleaners. Melt 1/2 cup butter and mix into batter slowly. 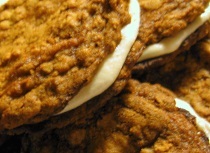 Topping : Cream together 1 cup butter (softened), 1 cup brown sugar, 2 Tbls. flour, 1 teas. cinnamon. Drop by teaspoonful onto batter and swirl with table knife. Glaze : 2 cups powdered sugar, 5 Tbls., 1 teas. vanilla. Whisk together and drizzle on cake while still warm. Thank you Rebecca for posting the Cinnamon Roll Cake recipe. I was hoping you would find it. I can’t wait to make it…sounds delicious!! Mix together in order given, and pour batter into greased cake pan. Stir together 1 c. brown sugar and 4 Tbsp.cocoa. Sprinkle on top of cake, then pour 1 & 1/4 c. hot water over everything. Bake at 350 for 35-40 minutes. Serve while warm with ice-cream or cold with cool-whip. Hey, A fellow by the name of Ken had shared a Lace Cookie Recipe w/ me. I never did make it and somehow deleted all his info, so Ken from Texas if you’re out there could you please give me the recipe again. My E-mail is posted further up. Dry Shoo-Fly pie! Hilda Alderfer (who has been gone from this earth some 50, or so, years) made the best dry shoo fly pie which people from our church would get first at church dinners because they were afraid it would be gone if they waited…and they were right! I love making that pie and many memories flit through my mind of her as I am making and eating it. Leave a reply to Which is the best Amish baked good?